The Yarns and Threads group will meet on Thursday this week, instead of Tuesday (Halloween.) Join the Yarns and Threads at 6:30 pm Thursday, November 2nd, in the library meeting room. Hey, Kids! It's the last Monday of the month and... We've got Lego Club today! Join us from 3:30 to 4:30 for building fun at the Paxton Carnegie Library. The University of Illinois Extension will present, "Who Gets Grandma's Yellow Pie Plate?" 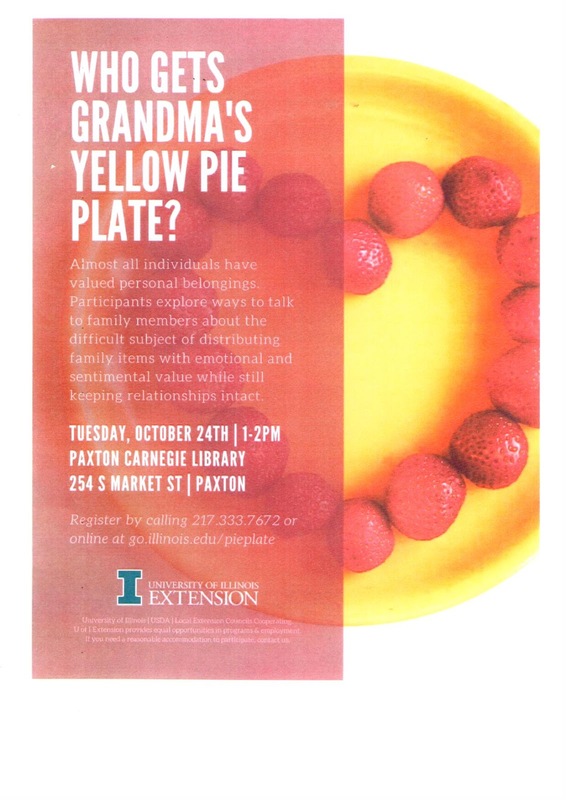 on Tuesday, October 24th, from 1 to 2pm at the Paxton Carnegie Library. Explore ways to talk to family members about distributing family items. 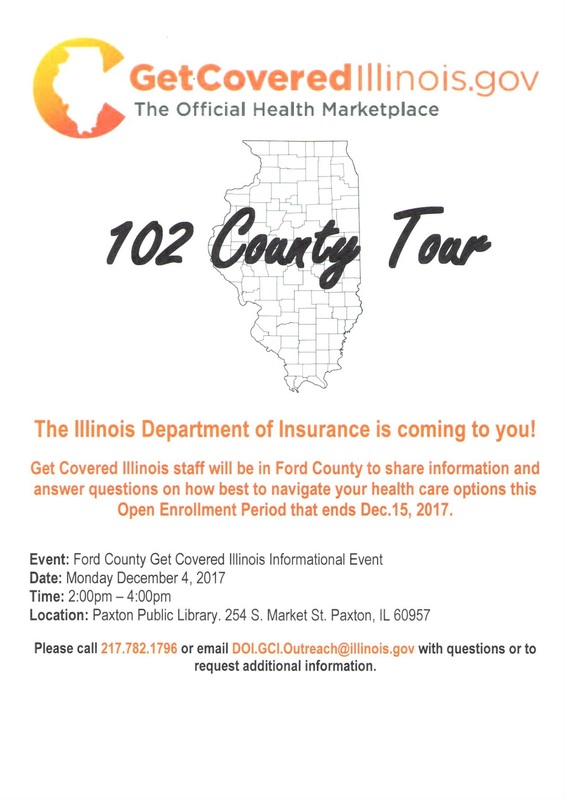 This is a free program, and everyone is welcome. 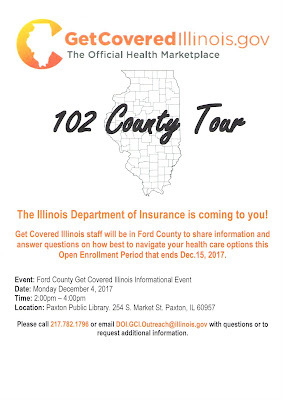 Register by calling 217-333-7672 or online at go.illinois.edu/pieplate. On Thursday, November 16, from 1 to 2pm, the Extension will present, "Looking for the Funny Side," a chance to bring humor into your life and learn how to use it to deal with stress and change. 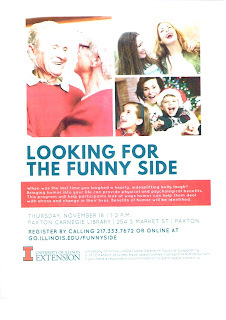 Register by calling 217-333-7672 or online at go.illinois.edu/funnyside. There's a new book club for kids starting up at the Paxton Carnegie Library. The Newbery Book Club will meet from 6:30 to 7:30pm, Thursday evenings at the library for summer reading fun. The first book discussed will be Joyful Noise: Poems for Two Voices, by Paul Fleischman. The age range suggested for this book is 8 to 12 or grade level 3 to 7. This book can be read with the group, at the meeting. The Newbery Book Club is a parent-sponsored group. For more information, email JanetKBrewer@cs.com. Something new at the library! Are you into knitting, crochet, embroidery, or sewing? A new social group, "Yarns and Threads," is meeting at the Paxton Carnegie Library from 6:30 to 8:15pm, beginning Tuesday, May 23rd. Bring your project along to the library meeting room and work alongside like-minded folks.Led by Thami Seabrooke, Yarns and Threads will be a great group for trading ideas and making new friends. Stop by the library Tuesday evening and get in on the very beginnings of a brand new group! Field Trip Day! Our library welcomed 4 classes of 6th grade PBL students as part of their Walking Tour this morning. They learned a bit of library history, trekked through the stacks, said hello to the bear, performed with puppets, looked for their favorite books, and created beautiful designs for our Magical Magnetic Wall. Thanks for stopping by, Ladies and Gents! Have a great summer! One final Story Hour for these three delightful children, and they're off to Kindergarten in the fall! We had fun reading stories, building Cat-in-the-Hat towers, and creating our very own clothespin puppets!